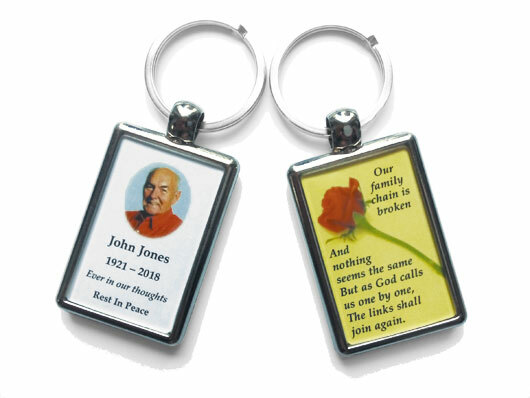 Your Memorial Card or Bookmark design can be adapted for the design of a Keyring. Our Silver Plated Keyrings are double sided and can include one or two sides (or an extract of each) of your Memorial Card design. Price is £6 for each silver plated keyring, if ordered at the same time as your memorial card design*. Please indicate when ordering which part of your Memorial Card or Bookmarks you want on each side. N.B: * If you are ordering keyrings or paperweights independently from a memorial card order please add £25 for initial design. Finepoint Graphics is a second generation family business. Established in 1977, we have been designing high quality funeral stationery for nearly 40 years.